I would like you to take a moment to think about the sharara. They’re beautiful and bright, traditional garments that look extremely flattering on everyone, even if you ate too much butter chicken. And they’re essentially like wearing your favourite pair of loose pants and sometimes, even come with pockets! So, why is it that more women are not rocking the one garment that has truly got their back – the humble sharara? 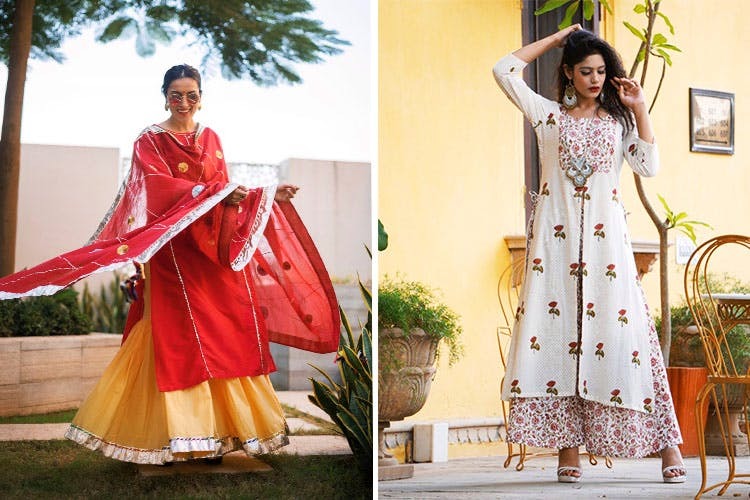 In the hope that I can help women realise what they’ve been missing out on, I’ve rounded up some of my favourite and affordable sharara brands. Make a style statement now with this gorgeous piece of clothing. Free Living makes the most gorgeous colour-block in the yummiest colour. The gota-work dupatta elevates the outfit and makes it look more festive. It’s the perfect fuss-free yet fashionable look for a day wedding ceremony. Buy here for INR 3,809. This fuchsia silk kurta and sharara set from Baise Gaba is one of my favourites for this season. The material is rich enough for an evening function, and the A-line cut and block embroidery add to its elegance. Since the embroidery is towards the bottom of the outfit, I would suggest going all out with a beautiful necklace or maangtikka to add some drama to the top. Buy here for INR 4,650. This is perhaps the best-selling pair of palazzos on our website- EVER! They’re feminine, intricate, flattering on all body shapes and just the perfect go-to outfit for every trousseau. Buy here for INR 2,770. This is definitely not your typical sharara. Combine the pastel blue-green and delicate gota detailing with the daring cold-shoulder/midiff-baring cut, and you’ve got an outfit that’s equal-parts sweet, and equal-parts edgy. Buy here for INR 5,490 .